As marketers, we know the value of a good online presence. We often talk about the importance of Google and of understanding the algorithms that govern the way businesses appear and are ranked in the Google search results. But we rarely talk about the rules that govern the algorithms themselves. Since it’s inception in 1997, Google has strived to ‘organise the world’s information and make it universally accessible and useful’. From Panda (content) to Penguin (links) and Hummingbird (semantics), algorithm updates are intended to help Google to identify those pieces of content which are most likely to meet the searcher’s needs. 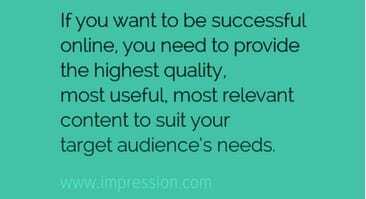 If you want to be successful online, you need to provide the highest quality, most useful, most relevant content to suit your target audience’s needs. Online marketing isn’t just about understanding algorithms for optimising for the right keyword. Savvy marketers understand the importance of creating great content. Whether you’re looking to reach an audience online or offline, you’ll need to have something worthwhile to say and share with them if the interaction is to have any impact. In recent months, content marketing has become something of a buzz term as marketers strive to create great content to support their online and offline marketing efforts. As with all marketing campaigns, your content will be far more successful with planning. Here are some content marketing tools to help you now and into the future. If you want to create great content that appeals to your target audience, you first need to be really clear on who that audience is. Who are you trying to talk to? What do you know about them and how can this help to guide the content you create for them? If your business is B2C, you’ll be considering similar things but swap out business related elements for things like life stage, where they live and so on. Your task is to create a really full picture of your target audience. You’ll find that your audience can be segmented, which is great too. Re-run the exercise for each segment, involve your team (especially sales team) wherever possible, and you’ll end up with a much clearer picture of who you’re trying to target. 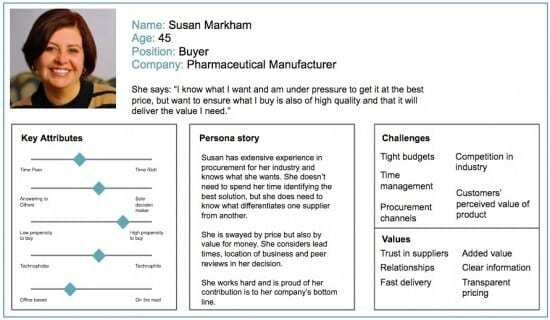 Many marketers, myself included, like to visualise these insights in the form of audience personas. A persona is an individual figure that’s represents a segment of your target audience; by giving them a name and a face, you empower yourself and your team to discuss very complex audience segments very easily - e.g. ‘Let’s talk about how best to target Tom’, or ‘Do you think this content would appeal to Jane?’. The reason your company came to be - what problem were you solving? Often, these brand stories translate into slogans and form the basis for marketing campaigns throughout your company’s lifetime. One of my favourite examples is Innocent, the company famous for making smoothies and other food and drink items. Take a look at their company story page for inspiration. So now you have a clear view of your target audience and have come up with a number of key brand stories that you want to tell. The next step is to cross-reference these in the form of a content grid. As you can see, by taking this approach, you can plan your content to meet the needs of your target audience and your business’ brand stories. You can then use this grid to plan out specific pieces of content. If you’re struggling to come up with the content ideas to fill in the grid, have a look around at content your competitors are producing and read through trade publications, forums and social media relevant to your target audience. 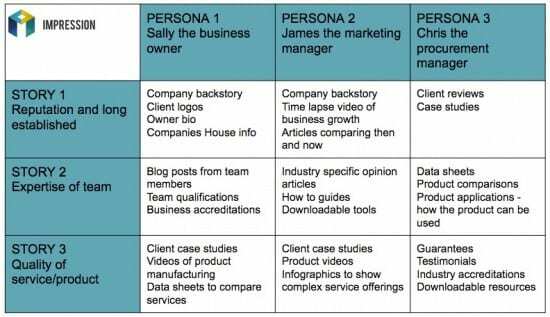 You’ll be able to repeat this process next time you want to refresh your content plan, helping you to focus your long term strategy within the guidelines of the personas and brand stories - which will likely stay the same for your business well into the future. Another tool we’ve used with our clients to help them plan their content strategy is that of the content target plan. Here, we scope out the content that is directly relevant to the product/service you’re trying to sell, and then go beyond that to understand more widely what your audience is interested in. Your personas will come in useful here too, enabling you to better ideate content with your audience segments in mind. Consider the topics that are directly relevant to your products/services/business overall. What is directly relevant to you and what you offer? This is the core content in your plan, that which explains what you do and offer and enables your audience to buy from you. These elements cover the basics of their product and enable people to understand what they’re buying. I call this the ‘core’ content because it is so important to get it right. Don’t fall into the trap of trying to be creative with your content if you haven’t first addressed the clear and concise explanation of your product/service. The next step is to consider what I call ‘funnel content’, this being the content that will draw people into your core content by appealing to their wider interests and concerns. Consider what content is relevant but not as closely connected to your product/service as your core content. 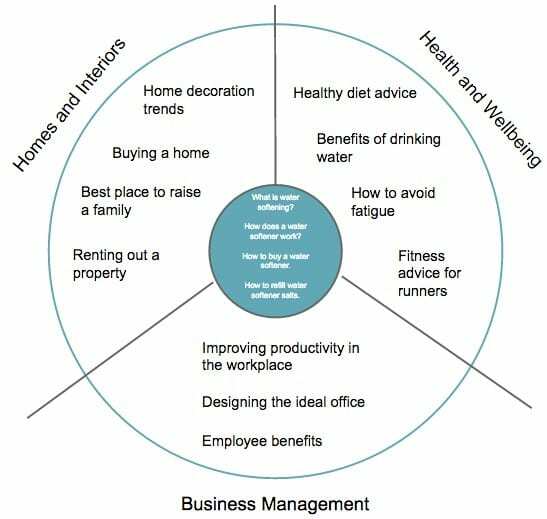 As you can see here, the content ideas have been categorised by theme, in this case ‘business management’, ‘homes and interiors’ and ‘health and wellbeing’. 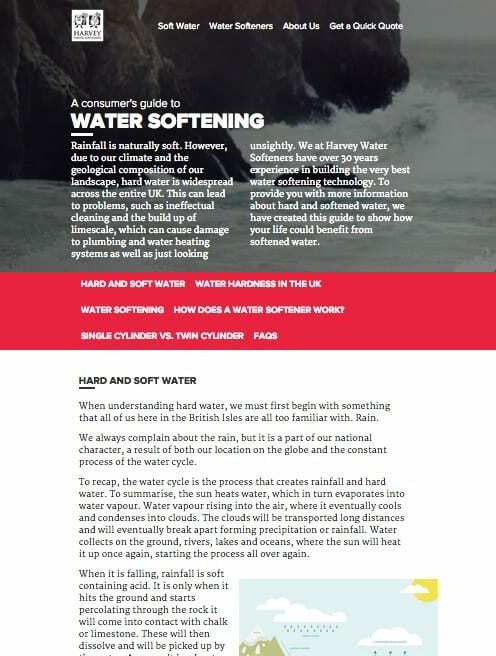 These are all themes which are relevant to Harvey - the water softening product is relevant to each of the themes - but is not directly about water softening itself. Using this approach, you avoid the common error of self-promotion and focus instead on creating content that is not too far removed from your skill set but broad enough to appeal to your audience much higher up the buying funnel. By creating this kind of content, you are able to promote your business to a much wider audience. 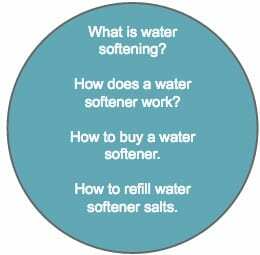 The water softener consumers’ guide explain to consumers everything they need to know when investing in a water softener. It covers what water softening is, how the product works and how to maintain the product, as well as where to buy it and how to install it. The content is structured as a guide and can be downloaded as a PDF too. 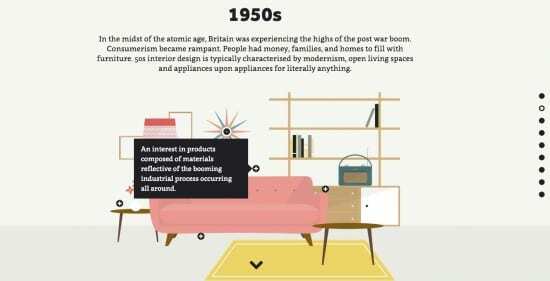 The history of interior design piece was designed to appeal to homeowners and anyone interested in interior design. With its modern, scrolling design and useful, interesting content, this piece has been viewed by over 70,000 unique visitors and linked to from over 90 different domains. It was also shared more than 2,000 times across social media, enabling Harvey to generate brand awareness amongst a much larger audience. The final tool I’d like to share with you is actually a set of tools, readily available to anyone, for free, to help inform your content strategy. The tools in question are forums and social media channels. Here, you can glean insight into your target audience; what interests them, what challenges them, what questions they ask and would like answered. It’s more of a reactionary approach to content planning as you’re responding to what’s trending rather than planning ahead, but it can still work really well. Google Alerts is free to use. Simply head to www.google.com/alerts and you can set up an alert for any keyword or phrase you like - I advise all my clients to set one up for their brand name as standard. Here, you can set up alerts for things like your product or service names, and for topics that you know to be of interest to your audience. Google will then email you daily or weekly with a summary of what’s been said across the web including those terms. Look out for people raising questions or sharing opinions. You can then take these questions or opinions and use them to inspire your content. For example, we might set up an alert to notify us of 'nottingham' AND 'business', so we can see updates about Nottingham’s business scene. As we’re based in Nottingham, we may find value in creating content that responds to the themes or questions raised as it would help us to appeal to local businesses that we might want to work with. I really like using Hootsuite as a tool for more intelligent Twitter management, and wrote an article on how best to use it, if you’re just getting started. Through Hootsuite, you can set up streams which can alert you to tweets which use specific hashtags or keywords. Much like Google Alerts, this enables you to create content which responds to questions, opinions and challenges to better appeal to your target audience. You can also follow Journalists on Twitter and monitor the hashtags they use via your streams. One example to follow is #journorequest, where Journalists share their requests for new content and comment. Keep an eye on these and look out for opportunities to respond to the journalist’s requests, and to identify what is considered to be newsworthy in your industry and those you serve. Reddit is a user-generated content hub, where users can add links to things they find interesting or start discussions with their peers. This can be another great place to source new content ideas, based on what your target audience is talking about. For example, I work with a company which sells holiday accommodation in the UK. Browsing Reddit’s UK section, I have found a thread which asks where the best hiking spots in the UK are. This would make a great piece of content for my client; we could create a guide to the best hiking spots in the UK, knowing that the topic is popular on Reddit and therefore answering a query which is likely to be relevant to our audience outside of Reddit too. Again, look out for questions in particular as these can be great inspiration for blog posts or guides. Remember to post your content as a response to the thread that inspired it for added traction. Your content marketing plan: what’s next? No matter how great your content marketing plan is, you’ll never see results from it if you don’t go ahead and create that content! My advice to anyone putting together their content plan is to ensure it’s realistic. Do you have a rota in place to ensure everyone has a turn? If your content’s more creative, such as the examples from Harvey given in this article, do you have the internal resources to create it or do you need to hire a content marketing agency to help? Videos can be really good content too; does your business own a video camera or can you get one? Use these tools to put your plan in place, apply deadlines and get creating. Then, monitor the results. Analyse the response to your content; did it receive the number of views you expected? Did you receive any enquiries? Was it picked up by the press or other websites? How well was it shared on social media? Analyse what worked well and what didn’t, to refine your strategy and do even better next time. I’d love to know what tools you’re using to guide your content marketing strategy, and to answer any questions you might have. Feel free to leave me a comment below. Thanks to Laura Hampton for sharing their advice and opinions in this post. Laura is the digital marketing manager at Nottingham based digital agency Impression. She specialises in SEO, content marketing and social media and has worked across a range of industries including tourism, professional services, manufacturing and ecommerce. Follow her on Twitter, connect on LinkedIn or Google+.